Marigolds' Loft: Filofaxiness - Stash Control - Filofax Style!!! 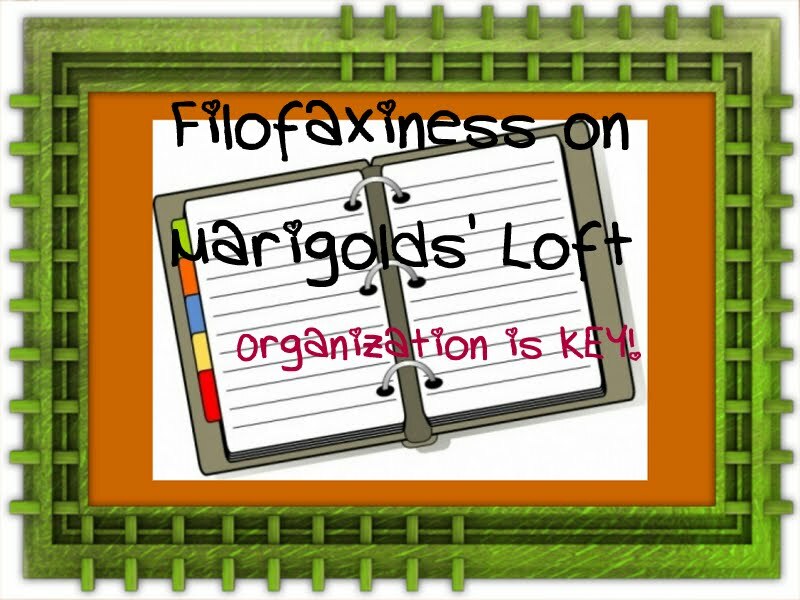 Welcome Back to Filofaxiness - the running Monday post on Marigolds' Loft where I will be walking you through how I stay on top of everything that I tend to fill my days and hours up with. Today I am going to be showing you how I have my stash organized. I used to have a hazy idea of how much, and which yarn was hiding under my bed, but that was it, it remained at a hazy idea. As with my tools, I was constantly rummaging through my stash to find out if I had enough of a given type of wool for certain projects. I wanted to have something that I could have on hand that included all possible details that I would need to know about a yarn.......how many skeins, thickness, colour, where I bought it, possible patterns etc. And so my Filofax Stash planner* was born! *Please note: I offer you these free planners for YOUR use only. They may not be sold, re-produced or otherwise. If you are using my planner please give me the credit - thank you kindly. Now I know exactly how much of any given yarn I have in my stash, the info on the label that I never used to write down, my gauge, needles, projects everything! A Note on Printing: When you come to print the page, please do click on the option "Print Current Page" because as much as I tried, my PC refused to allow me to save only page 1, so there are 2 pages in the PDF but the second page is empty, sorry about that. It is a Landscape view. 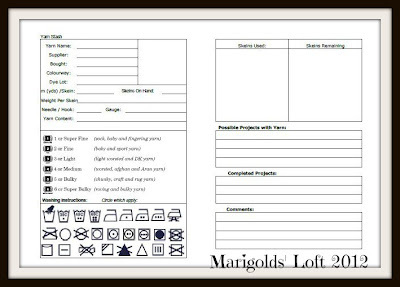 The Printable is made on an A4 sheet, this is so that if you have an A4 planner you can print it as it stands. My Filofax is an A5 and so I print it out and then print the same on the back, cut it in half and then punch it. To see how I put this planner to use in my Filofax, please watch the video below. Don't forget to come past next week where I will be showing you how I organize my WIPs. 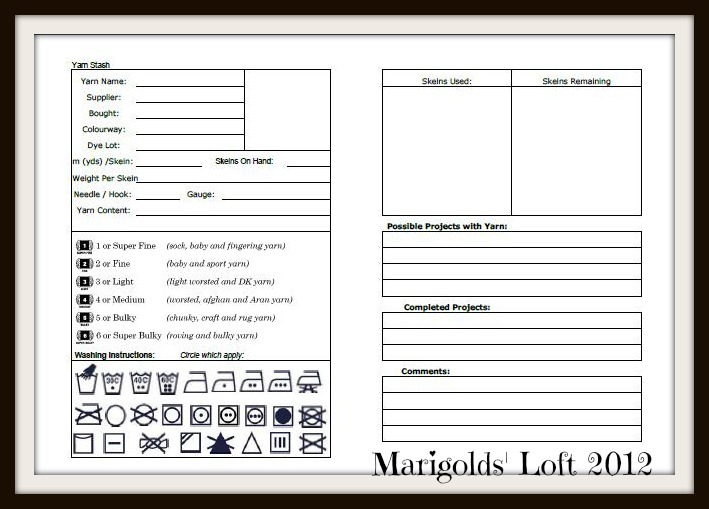 I would love to hear from you, have you used my planner? Any ideas on what else you would like to see? All your comments are very welcome and much appreciated! I will share this post with all of my lovely Link Ups. You made me laugh, I would definitely consider it, are you small, cute and cuddly? What a great idea... and so organised... I ought to do something similar for my fabric stash! I love it, it works so well, took me a long time to fine-tune it, but I am thrilled with how it turned out! And it is actually fun, now instead of whipping out a wool sample booklet I grab my Filofax and ooh and ahhh about the samples I have....the best thing is, I already bought those!!! More great organisation! Thanks for sharing. Very organized! My extra yarn is in giant garbage bags in an old chest and some under my bed because I just haven't figured out a better way to deal with it yet. :-) Thanks for sharing at The Fun In Functional! I need organization help at my house!! Mostly my crafty supplies...disaster zone! Please come help organize my house! LOL! Ah... this is just what i wanted but didnt know that i whanted. So good. Maby know I can be organized. Thank you!